The IMAGES Holiday Tour of Homes will present unique homes decorated for the holidays and showcasing the charm of New Smyrna Beach. This is a favorite event of the Central Florida community, and groups of friends attend year after year as a kick-off to the holiday season. Everyone loves the Holiday Boutique! Shop for creative gifts at the popular IMAGES Boutique, included with your tour ticket. You will find an array of beautiful handcrafted items by local artists and ACA Volunteer League Members. Held at Atlantic Center for the Arts Downtown, Arts on Douglas, 123 Douglas Street, NSB. Get a jump start on your holiday list and shop for a cause! 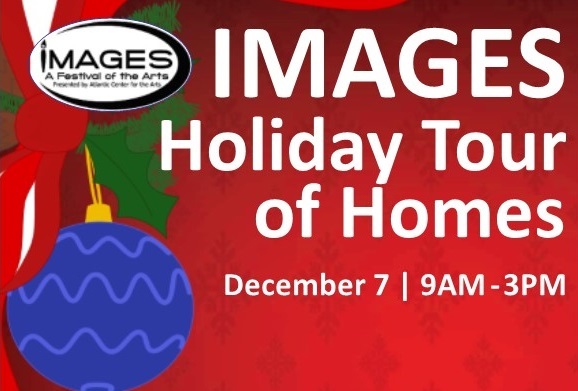 The IMAGES Holiday Tour of Homes is the main fundraiser for IMAGES: A Festival of the Arts. More than 1,000 people attended the Tour in 2018, raising nearly $25,000 for prize monies for the Festival. Thank you to all who attend, and to the homeowners and florists who fill this event with holiday cheer!